Since on Easter Sunday, everyone is already decked out in their beribboned bonnets, and springtime finery, celebrating after church with an elegant Easter Brunch is a no-brainer. Brunch has always been one of my favorite things. Because it combines two meals into one, it allows me to feel less guilty about consuming things like pancakes, waffles, and French toast, which are essentially desserts, masquerading as entrees. It also gives me license to indulge in a cocktail before 5 o’clock. Need I say more? When my children were little, and we lived in our hometown, I used to host a large, lavish brunch buffet and Egg Hunt for our extended family on Easter. Nowadays, however, we live away from most of our relatives, my babies are adults, and the Easter Bunny has forsaken us, so we usually go out for brunch. But here’s the thing, currently I really have a hankering for this wonderful orange-flavored creamy, custardy baked French toast casserole that I found in Ina Garten’s book “The Barefoot Contessa, How Easy Is That?” It’s made with challah bread and orange zest and, when smothered in real maple syrup, it’s to die for. So, to satisfy this craving, I have decided to make the ultimate sacrifice this year and cook. My Easter Brunch menu for my husband, myself, and our two girls will include the baked French toast, sausages, a large fruit salad (just so it doesn’t seem entirely unhealthy) and since we are all adults now, I am definitely serving Mimosas. 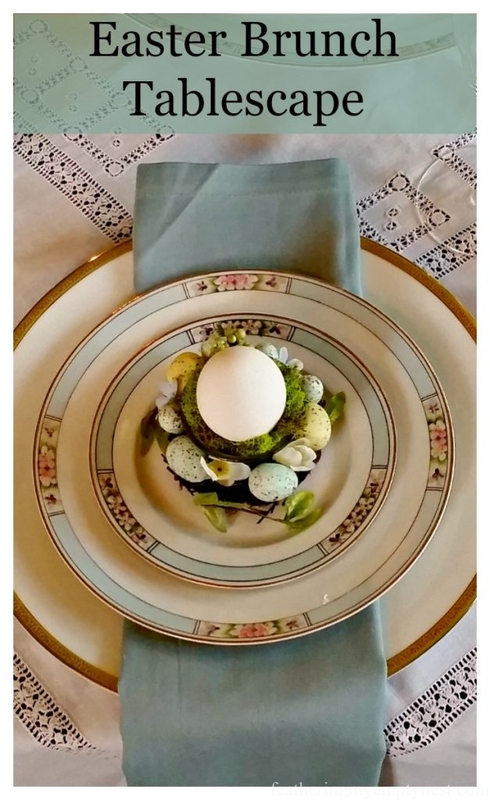 Now that I have committed to making brunch, I have to think about creating an Easter Tablescape. The foundation for my table is a small vintage linen cutwork tablecloth I placed on the diagonal. 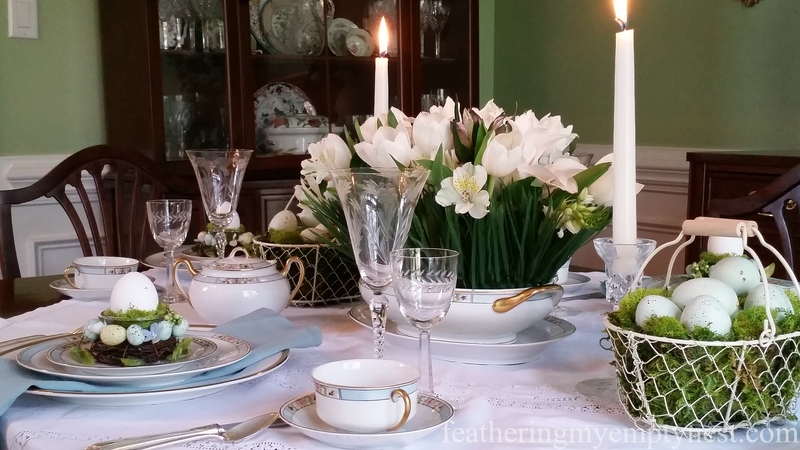 For this intimate brunch, I decided to use the antique handpainted Nippon china I inherited from my great great aunt Laura because, with its light blue border and delicate pink and violet flowers, it just looks like Easter to me. Antique Nippon Blue Band & Floral Edge, Gold Trim luncheon china set and Charter Club Grand Buffet plate with Gold trim. 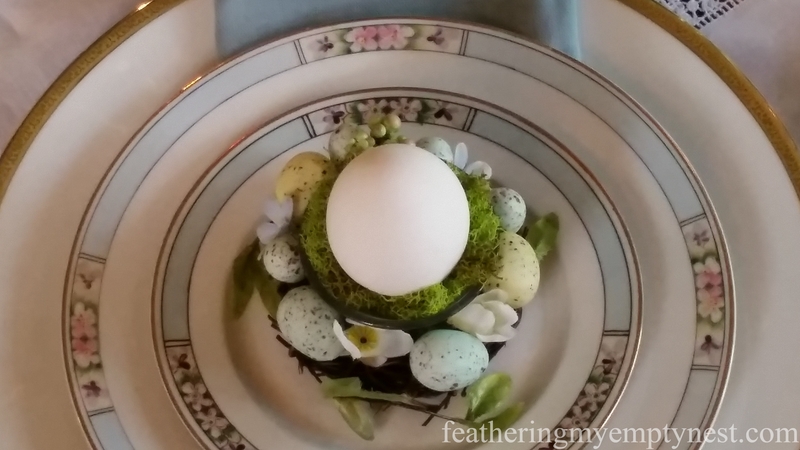 I used light blue napkins, and on each plate, I placed a large white egg, nestled in a bed of moss, inside a blue speckled egg-decorated votive holder that I purchased from Pier One. I completed the place setting with my grandmother’s silver flatware and my husband’s grandmother’s etched crystal goblets and juice glasses. Even though brunch is served in the late morning or early afternoon, I always like to have candles on the table. 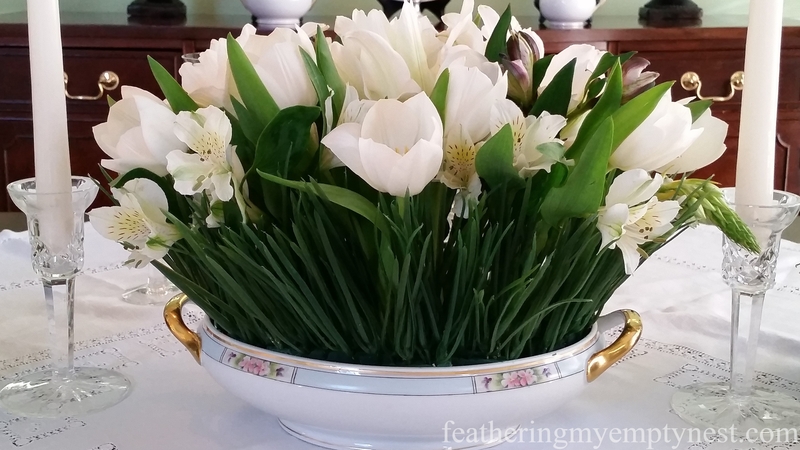 For a centerpiece, I created an all-white floral arrangement of tulips, lilies, alstroemerias, and stars of Bethlehem surrounded by faux grass and arranged in the oval serving dish that matches the china. White tulips, lilies, alstroemerias, and stars of Bethlehem are surrounded by faux grass picks and inserted into an oasis brick placed inside the matching oval china serving dish. I also placed two small egg baskets filled with moss and blue speckled eggs on the table. Crystal candlesticks with white tapers complete the tablescape. 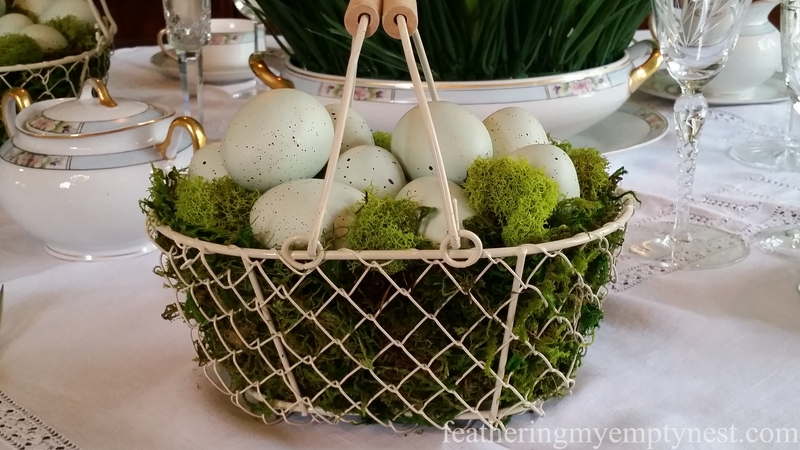 Small cream egg basket from the World Market filled with moss and faux blue speckled eggs. 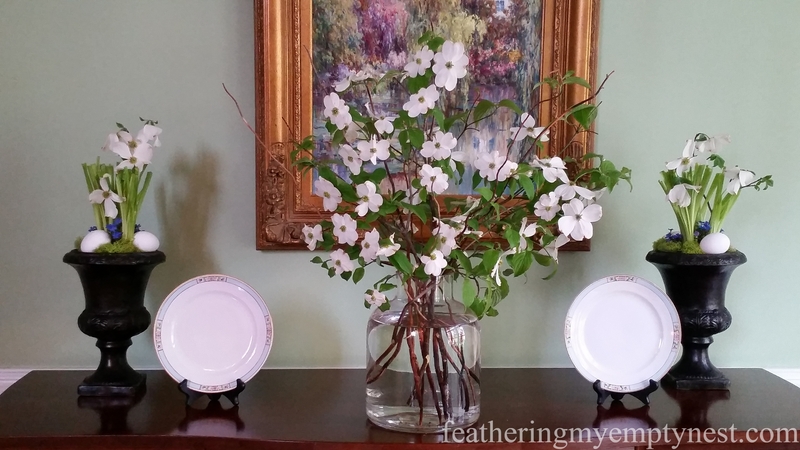 On the buffet, I placed a large glass vase filled with dogwood branches from my yard. I flanked this arrangement with a couple more of the china plates and a pair of urns planted with daffodil greens, eggs, and more dogwood. White dogwood branches cut from my yard. Reading over this post, I can already see my kids rolling their eyes at me. They will say, “why go to all the trouble of flower arrangements and fancy table settings when it will just be the four of us for Easter Brunch?” My answer to this, however, is that holidays spent with family are always special and as such, always deserve to be celebrated with a bit of fanfare (and French toast casserole), no matter how small the gathering. Your table setting is absolutely beautiful! 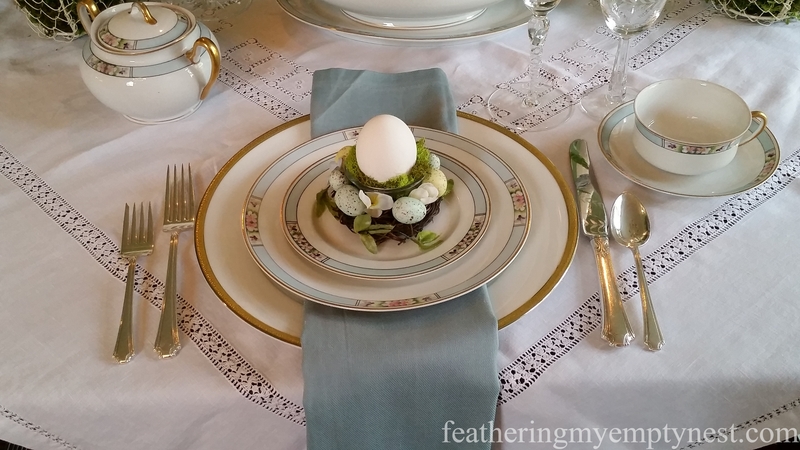 I love the antique china, and robin’s egg blue is one of my favorite colors. Your kids can roll their eyes all they want, but I agree with you. It’s never a waste of time to set a beautiful table, even if there will only be a few family members present at the meal. 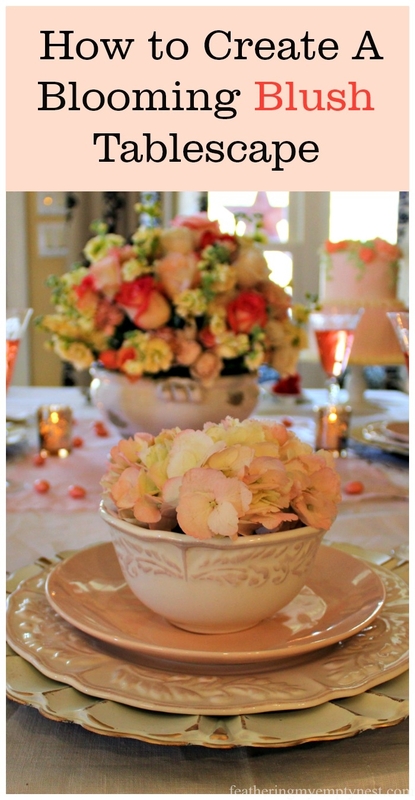 The flowers, candles, linens, and décor items help to make it a special and memorable occasion. Thank you so much for your kind words about my tablescape. It was really great to be able to use my aunt’s pretty blue china. Because it only has luncheon plates, it isn’t appropriate for most occasions but I think it works well for brunch.Thanks again. Have a great weekend. This seems like the perfect table setting for an “adult’s only” Easter Brunch! Beautiful! Thank you so much for taking the time to comment on my post. Have a great weekend. This is so lovely! 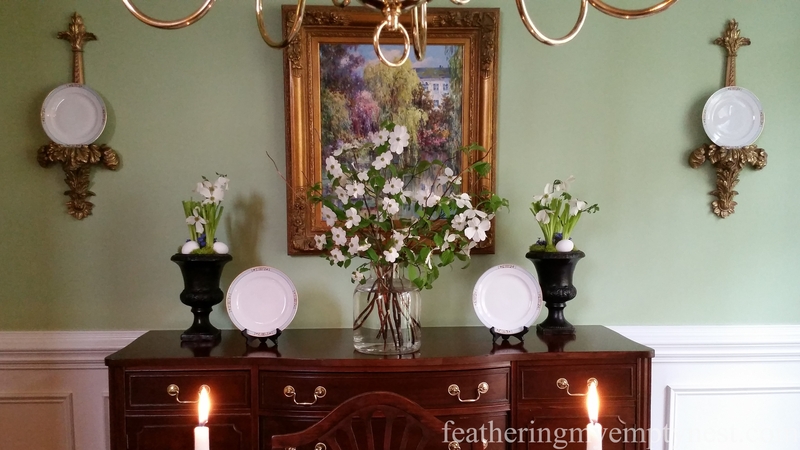 The dogwood branches are an especially nice touch. Also, having read this I am now craving french toast and a good mimosa. Thank you so much for taking the time to visit my blog. Definitely, try The Barefoot Contessa’s French Toast Casserole. It’s really worth the effort. 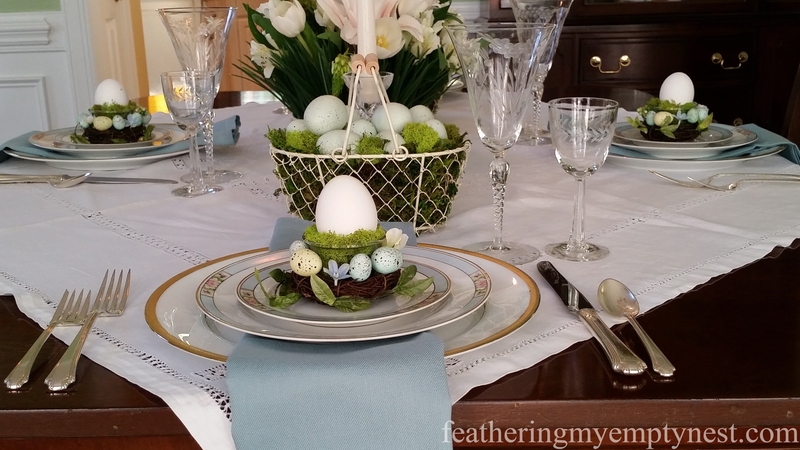 Thank you so much for your kind words about my Easter tablescape post. I do really love providing a special experience for holiday gatherings. I hope you have a happy Easter as well. 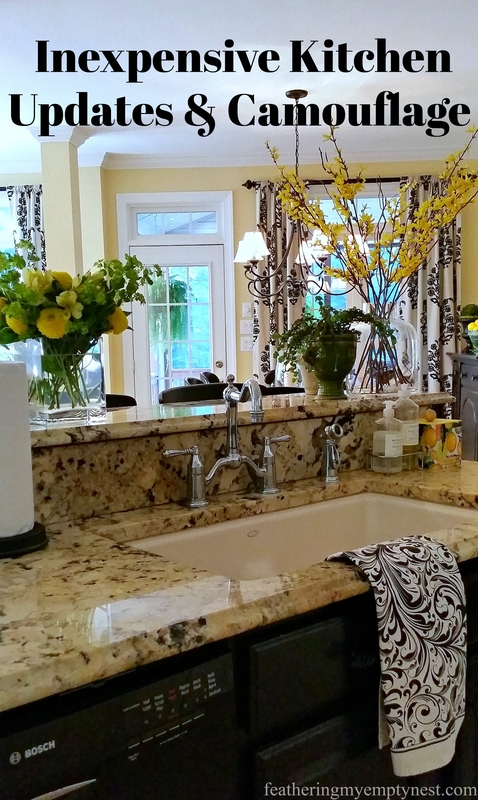 I love that you used inherited pieces – they surely represent family! 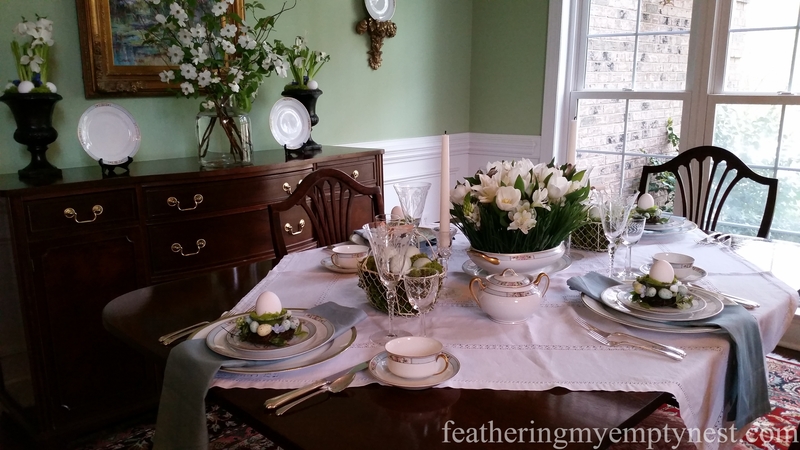 I like the mix of antique dinnerware with contemporary styling and Easter-themed decor. A lovely table! Thank you so much for taking the time to comment on my post. I hope you have a very happy Easter. Just beautiful! I love the vintage cloth and those stunning hand painted dishes. 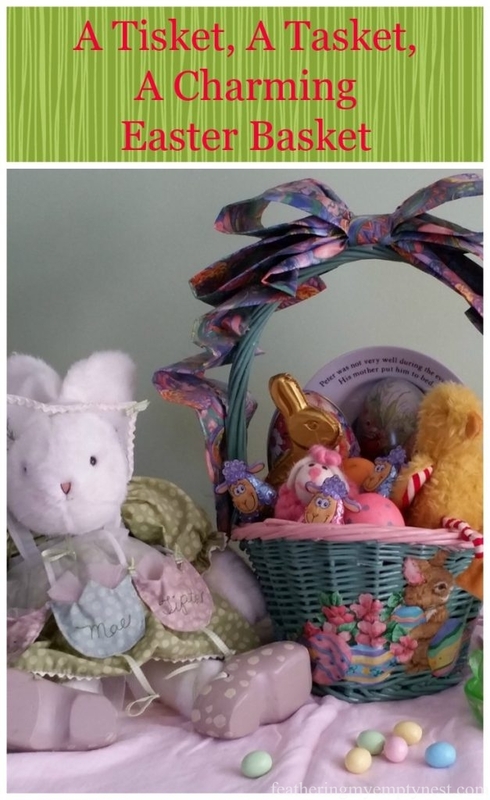 You really pulled it all together with a lovely Easter theme. Thank you so much for taking the time to visit my blog and for your kind words about my post. I wish you a very Happy Easter! I love your tablescape. So lovely and the Robin egg blue was my Dad’s favorite color. I would enjoy sitting at your table. Thanks for sharing at Over The Moon Party. Hope you come back next week so I can stop by again. I hope you will stop by Thursday Favorite Things tomorrow. 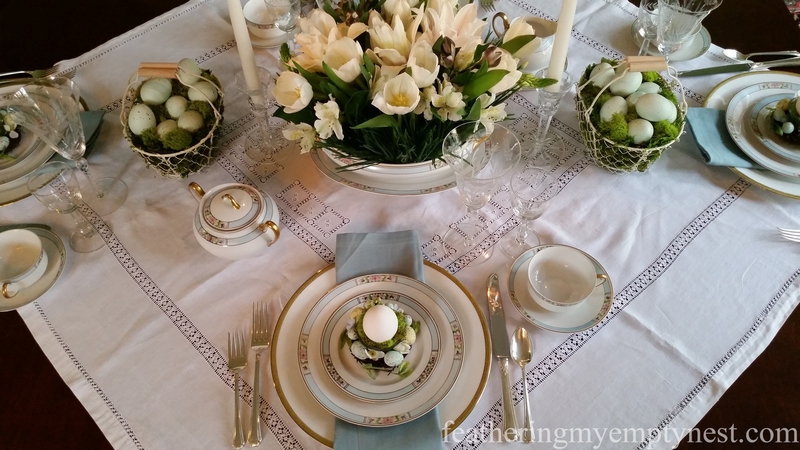 Thanks so much for your kind comments about my Easter Tablescape and thanks for hosting a great party. Wow, Lisa, I would love to come to brunch at your house. Your table is so pretty. Blue is my favorite color and you are fortunate to have some beautiful family heirlooms. I love french toast too and your casserole is making my mouth water just thinking about it! Thanks so much. Definitely, try the french toast. It really is to die for!